NOTHING LIKE CATCHING A METRE BARRA ON YOUR WIFES 40TH ! 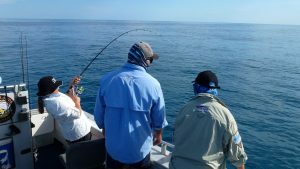 The Patmore family decided to do a family fishing trip to celebrate Jenni`s 40th birthday. 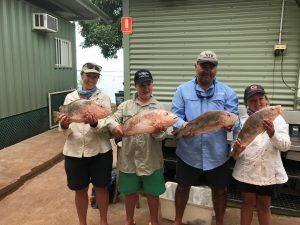 First day they hit the bluewater , smashing spanish macks and golden snapper . 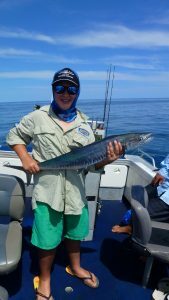 Day 2 mixed it up with some Black Jew fish then onto some decent size barra with wife Jen in the lead for biggest on blue and biggest barra. 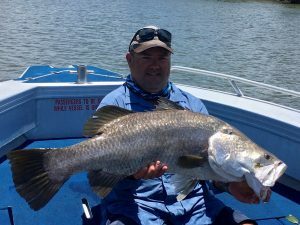 Last day, they hit a few more of our exclusive estuary systems but it was Jessie River that proved to deliver with Mark landing this 101cm beast of a Barra ! 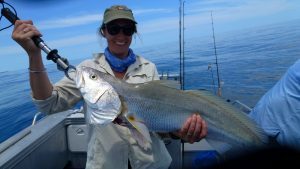 Nothing like out fishing your wife on her 40th birthday ……..
Book your family trip today !